Roast chicken has quite a place in a lot of people’s hearts because many of us grew up with it. For Mimi, the creator of this yummy dish, roast chicken is at its best when made by her mum. "My mum used to make roast chicken for every evening meal - it was a great time in my life!" says Mimi. This Mimi roast chicken is the easy version for a delightful mid-week supper! Pre-heat your oven to 200 degrees. Chop the potatoes into 2cm pieces. Peel the carrots, remove the tops and bottoms and cut in half lengthways, then chop into batons about the size of your little finger. Separate the broccoli into florets. Pull the thyme leaves off their stalks. 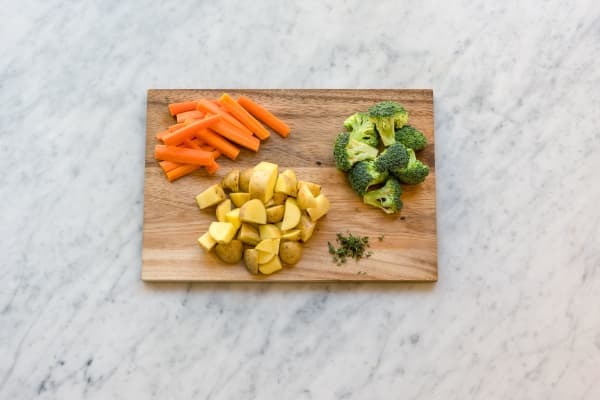 Pop the potatoes on a baking tray, drizzle over 2 tbsp of oil, ¼ tsp of salt and a good grind of pepper. Give the tray a good shake and put the potatoes in your oven to roast for 30 mins. Meanwhile, season each of the chicken breasts with a pinch of salt and a good grind of pepper on each side. Add 1 tbsp of oil to a frying pan on medium-high heat and lay in the chicken breasts skin-side down. Cook for 4-5 mins or until the skin is crispy. Tip: Don’t touch the chicken during this time or you won’t get crispy skin! Once the skin has crisped up, remove the chicken from the pan (but leave the juices and oil in the pan). 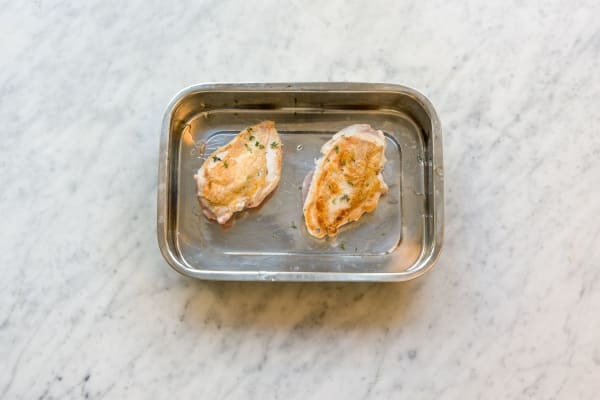 Put it on a lightly oiled baking tray skin-side up and sprinkle with the thyme leaves. Put them in your oven to cook for 25-30 mins. The chicken is cooked when no longer pink in the middle. Tip: Don’t wash up the pan you cooked your chicken in, you will need this for the gravy later! Whilst your chicken and potatoes cook, put a pot of water on to boil (the water needs to be about 4cm deep). Once the water is boiling add ¼ tsp of salt and the carrots. Put the lid on and leave to cook for 10-15 mins. Once your carrots are cooked, drain them and put them back in your pot. Add the honey, a really good grind of pepper and stir well. Put the lid back on the pot to keep your carrots warm. Meanwhile, make the gravy. Put your chicken pan back on medium heat and add the flour. Stir the flour into the chicken juices (if your pan is a bit dry just add 1 tbsp of oil) and cook for 2 mins, stirring a couple of times until the mixture is properly combined and has cooked off slightly. 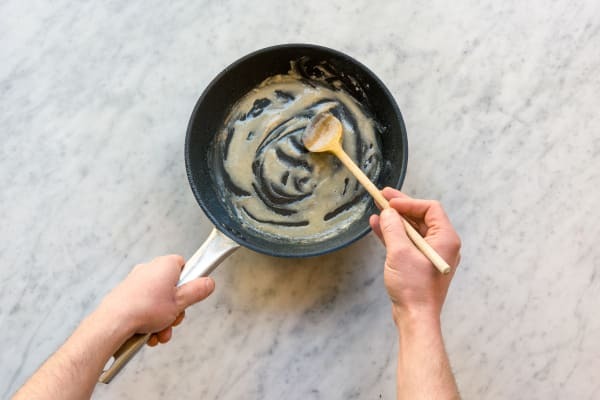 Tip: Combining fat and flour makes a ‘roux’ which is used to thicken sauces! Add the chicken stock pot to your pan along with 300ml of water. Bring to a simmer whilst stirring (or whisking if you have a whisk!). Make sure the chicken stock pothas dissolved and then simmer for 3-5 mins to thicken up your gravy. When the gravy is cooked, leave to the side whilst you cook the broccoli. Tip: If you need to warm your gravy before plating up, just put it on the heat for 2 mins to warm through. 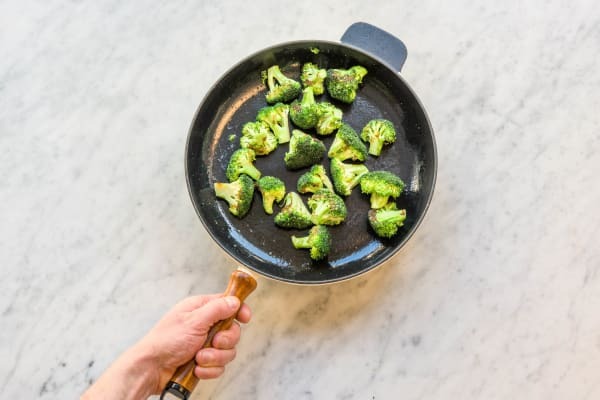 Add 1 tbsp of oil to another frying pan on medium heat and add the broccoli, along with a pinch of salt and a good grind of pepper. Stir-fry for 3-5 mins until slightly crispy on the outside and cooked through. Take your pan off the heat. 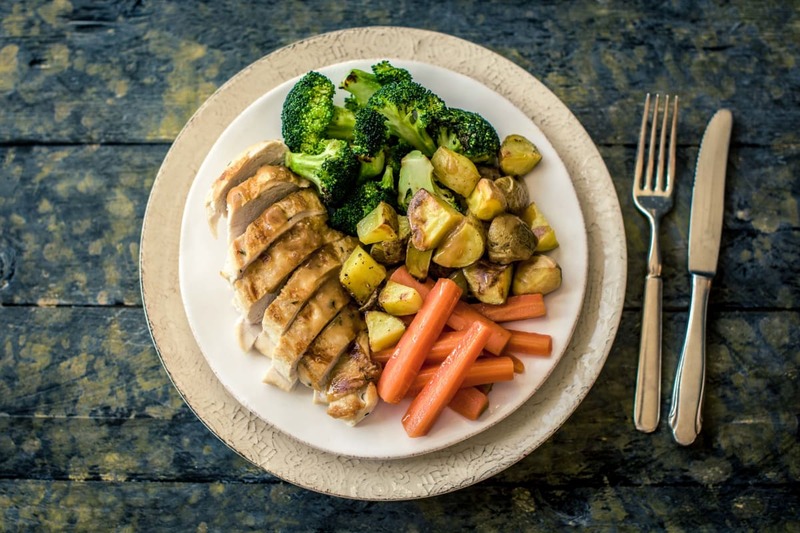 Cut your chicken into 2cm thick slices, serve on plates with your roast potatoes, veggies on the side and a drizzle of gravy! Enjoy!